I'm a huge advocate for local multiplayer. I've filled my Steam Library with games like Samurai Gunn, The Yawhg, Monaco, and Nidhogg, and the most frequently played game on my PS4 is Towerfall: Ascension. I have utterly refused to purchase Halo 5 unless it somehow reintroduces a split screen co-op mode. So far, I've been lacking in good couch co-op games for the XBox One. I really like the FIFA and Forza series' but Wesley is not much for sports or racing games. We do have the excellent Rayman Legends but we're running out of teensies to rescue. We needed something to feed that fix and we found it in Lovers In a Dangerous Spacetime. The quirky little game from Toronto based Asteroid Base is available on Xbox One and PC. You and a partner play as adorable astronauts (known as The Lovers, or The League Of Very Empathetic Rescue Spacenauts) who must recapture the pieces of the Ardor Reactor to restore love to the universe after a malfunction opened a rift to a dimension of anti-love. Explaining it makes the game seem weirdly schmaltzy, but make no mistake, this is a seriously entertaining and difficult game. Your ship is a large, round thing with multiple rooms, each housing a different station. You have an engine station, shields, a super weapon (called the Yamato Cannon), a map and various turret emplacements. 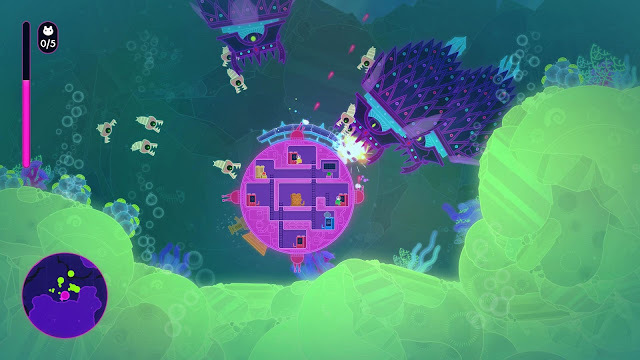 With 8 stations and only two players, you are forced to run between various stations constantly, trying to fight off waves of enemies while searching for cosmic bunnies and frogs to rescue. Because the threats can come from any direction, you find yourself weighing the importance of being at a given station almost every minute. It's a kind of tension I thought was reserved for fast-paced twin stick shooters. There are 10 cosmic critters to rescue in each level, though you only need 5 to advance to the next stage through a heart shaped wormhole. Also scattered throughout each randomly generated level are little packages that award different kinds of gems. these gems can be attached to different stations to give them different abilities. The yamato cannon may become a giant, spinning saw blade, your shield might start reflecting enemy fire or your engine might drop mines in your wake. Later upgrades allow you to put multiple gems on a single station, leading to some interesting combinations. Our favorite powerup for the Yamato cannon. Two power gems allow it to fire tons of little seeking missiles. 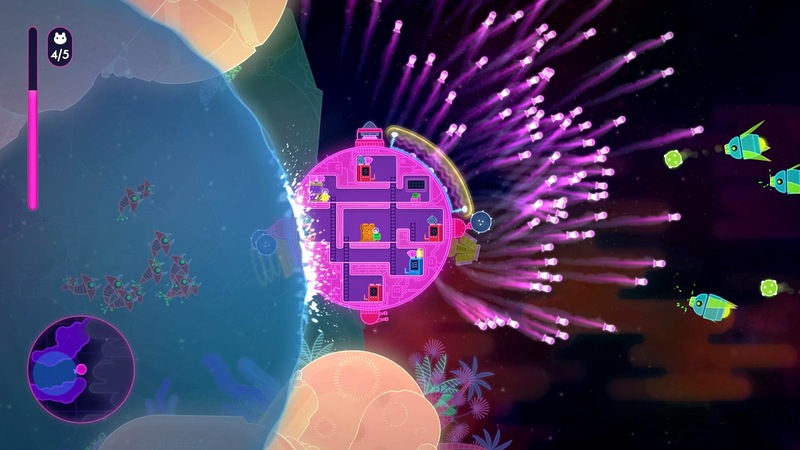 Even on the Normal difficulty setting, Lovers in a Dangerous Spacetime can be very difficult. The enemies are numerous and can overwhelm you pretty quickly if you aren't careful about where you go and how you engage them. They also pack quite a punch. If you end up surrounded (and you will), you can lose most of your health before you realize what's happened. Many of the bosses are capable of taking at least 1/3 of your health in a single hit It isn't impossible to get out of those close calls as long as you and your teammate can effectively communicate with each other, and the moment when you turn the tide of a seemingly hopeless fight is one hell of an exhilarating rush. Lovers in a Dangerous Spacetime begs you to test your limits. Even when the ship is nearly destroyed, Wesley and I will soldier on sweating bullets the entire time, trying to root out every cosmic bunny and secret present from every level. In those moments we usually adopt a hit and run strategy, grabbing what critters we can and booking it out as fast as possible while the other player mans the shields and keeps a close eye on the Yamato cannon. It's worked well for us many times, but unfortunately the game doesn't let you run from every fight. This level took us at least 7 attempts to beat. Those big guys can only be hurt after they collide with your shield. We adore this game. 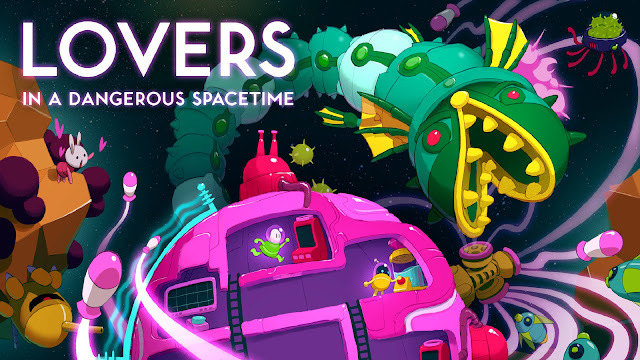 Lovers in a Dangerous Spacetime has become our go-to game to play together in the evenings. Though stressful, it is never too much to handle. The gameplay quite gracefully walks a fine line between determination and exasperation. The near constant danger of each sector, coupled with the need for constant communication keeps you on your toes, even when you aren't in combat. This game is marvelous, and the moments that you and your partner execute plans perfectly is god damned transcendent. Choose your partner wisely; this game will test you both.